LexLin Gives Back is a three-part blog series that tells the story of LexLin’s Gypsy Gift donation campaign through the eyes of the children of LexLin Gypsy Ranch owners Eric and Mechelle Barton. Lexi Barton, the eldest daughter of two girls and three boys, writes the following blog. 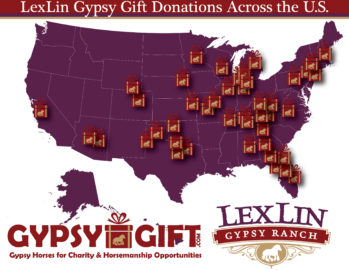 In this second blog, Lexi shares her perspective on how LexLin has seen an outpouring of support for LexLin’s Gypsy Gift program over the years and how countless lives have been impacted across the country. The three-part blog series will conclude with a final blog written by Cody, which will be published Oct. 1st. From all of us at LexLin Gypsy Ranch, we hope that you enjoy this unique perspective from LexLin’s next generation. Lexi Barton, the eldest daughter of two girls and three boys, shares her perspective on how LexLin has seen an outpouring of support for LexLin’s Gypsy Gift program. Since we have begun this “Give Back” journey, we have seen our LexLin following grow exponentially. Being a part of this experience that provides services for others has been an incredible journey. 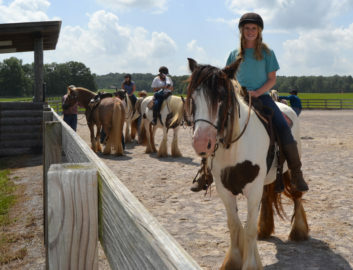 Providing people in need with an opportunity to impact and enrich the lives of the developmentally disabled, sick, injured, troubled and developing lives on a daily basis by receiving one of LexLin Gypsy Vanner horses is an honor. Gypsy Horses are gentle loving animals and we at LexLin do believe our horses are fit for this type of work. I believe that LexLin has given me the surest way to find happiness in my own life, which is to help others find happiness in theirs, whether that be across the U.S. or around the world. Lexi pictured at the Smoky Mountain Service Dogs Auction, where LexLin donated proceeds from the day’s horse auction to the nonprofit program, which helps disabled veterans by pairing them with service dogs. For me, I have been in awe over the years witnessing all of the positive feedback on LexLin’s Facebook and other social media accounts. I love to read the testimonials and positive feedback these horses have been making in people’s lives. LexLin has donated 45 horses within the past three years with plans to donate many more to PATH International Premier Accredited therapy centers. These have an impact on 169,000 lives on average per year or 3.4 million lives, not including their families, loved ones and friends, over the next two decades. Here is some feedback we have gotten over the years that have really touched my heart. LexxiBeth, a Gypsy Vanner President & CEO Dr. Eric W. Barton named after his eldest daughter, Lexi. 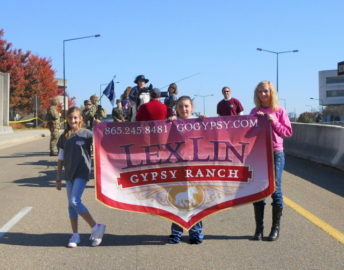 Lexi, far right, and her younger sister Lindie pictured during a Veteran’s Day parade. 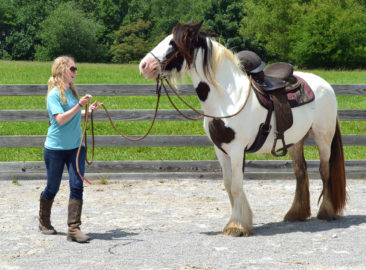 Through Gypsy Gift, the community plays a pivotal role on which PATH center will receive a Gypsy Vanner horse. How the voting process works is based on fan favorites. When in the running, the community will vote for a fan favorite by “liking” and sharing through Facebook to spread the word. After the centers have been selected, the top nominated and one client selected by Lexlin staff will be able to enter the Lexlin Gypsy Gift program. This year’s Gypsy Gift campaign received overwhelming support with 33 therapy centers receiving a combined 171,675 votes in less than two months of voting. Several of the winning centers received more than 1,000 votes in one day towards the end of the voting phase, and the winning centers from No. 3 through No. 11 varied fan favorite placement day to day. The 11th place center received 13,000 votes and was only 161 votes behind the 10th place center. 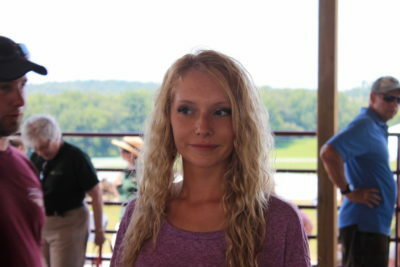 A teenaged Lexi shows affection to the Gypsy Vanners at the LexLin Ranch in Rockwood, TN. While our family has seen an overwhelmingly positive response to our Gypsy Gift initiative, it has been even more powerful for me and my family to witness the positive impact LexLin’s Gypsy Vanner horses are making in countless lives each week. According to feedback we’ve gotten from some of these therapy centers, each of the horses regularly impact 50-100 lives on a weekly basis. And as you can see in the graphic included in this blog, these horses and therapy centers are spread across the United States. Giving to PATH-accredited centers was the perfect fit and exposed the Gypsy Vanners to an even greater potential of positively influencing as many lives as possible. PATH International, dedicated to promoting safe and effective therapeutic horseback riding throughout the U.S. and Canada, has more than 850 member centers and nearly 7,600 individual members in countries all over the world today who help and support more than 54,000 men, women and children with special needs each year through a variety of equine-assisted activities and therapy programs. 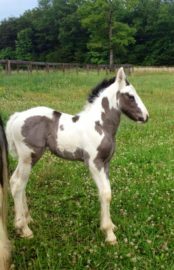 LexLin only picks the very best purebred Gypsy Vanners, which are DNA verified Gypsy horses registered with the Gypsy Vanner Horse Society, providing the horses with only the best care and professional training.